﻿﻿ Efficiency of Generator Motor (1)explanation｜products｜Murata Software Co., Ltd. Analysis model is comprised of a high power generator motor (HPGM) and a turbo charger generator (TCGM). The power is transferred through an inverter. 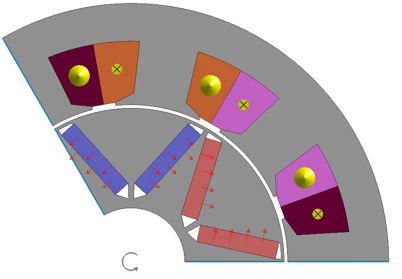 The generator motor turbo system is as shown in the Fig 1. At a high speed driving, the TCGM generates the power and drives HPGM. 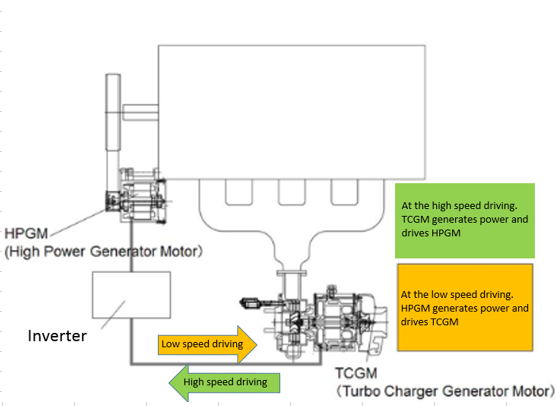 At a lower speed driving, the HPGM generates the power and drives TCGM. To increase the efficiency of the HPGM, the number of turns of coil was reduced so as to reduce the copper loss. Also, the tooth width was reduced to secure the slot area as in Fig 2 and Fig 3. 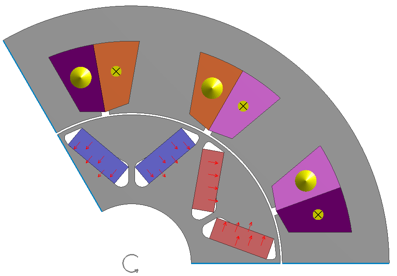 To compensate the reduced turns, the magnet area was increased to increase the magnetic flux. 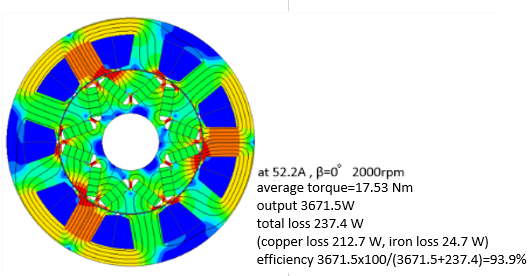 As shown in Fig 4 through 7, the efficiency was improved by 1.3% at 2000rpm, and by 0.8% at 6000rpm. Efficiency improvement of 1% translates to the cooling loss reduction of approx. 20%.